The Polished Teacher: Currently February Say What??? A whole month down in 2013 already! How did that happen? Where did the time go? It seems like it was just Christmas! It may be the fact that I randomly found hidden Christmas decorations around the kitchen today. Like my sweet Gingerbread stuffed animal chef hiding under the cupboards. February is the shortest month but it is jam packed! Kicking off February right, it's time for another edition of Farley's currently! Listening: American Idol has been a long time favorite. I love singing competition shows! I am not a fan of auditions but I watch anyways. Any favorites yet? I love the guy who got the speech impediment after having his tonsils out but sings like an angel! Loving: All 3,000 of my teaching files have finally been organized into files by subject/theme. It took months but it makes me feel so much better and I can actually find everything! Love it! Thinking: Back in school and waking up early, I need to adjust my sleeping habits and go to bed early. 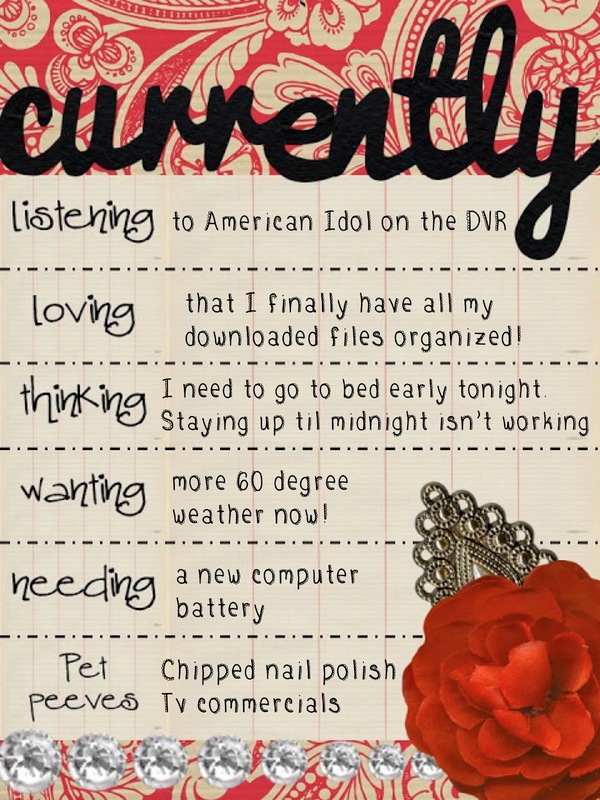 It's just so hard with all the great tv shows on late at night and no DVR anymore! Wanting: It was such a tease having 60 degree weather this week. Back in the low 20's is not making me a happy camper walking around campus at night! Needing: This is a necessity! My battery lasts at most 2 hours and needs to be charged constantly. The only problem is that I need at least 2 weeks to send it out to be fixed. I can't survive without my laptop for 2 weeks! Think of all the great freebies I'd miss! Pet peeves: Chipped nail polish, 'nuff said! It's the worse! And tv commercials are getting on my nerves. Watching everything on the DVR for over a month and then going back to watching The Bachelor with 2 hours of commercials isn't making me one happy camper. Hope you all have a "sweet" month! Hurry on over and see what everyone else is doing this month! I can't believe you've organized all of your files! I am so jealous!!! We had a few nice days too. Back to winter today. Stay warm! My nail polish is so chipped right now- you would be disgusted. I should have put "manicure" under my "needing" section. Ha! I hope it warms up, too! I"m SO impressed and jelly about your files!!!! GREAT job!!! I am impressed that your files are all organized. I always have the best of intentions. I never watch American Idol, but a former student from my school made it to Hollywood. I might have to start watching now! OMG! I just LOVE your blog design!! I love wacky nail polish colors, and I hate it when they chip! Such a cute blog! And how in the world did you go about getting all of your files organized? Jealous! I'm a new follower....found you through the linky! What a cute blog design! I am your newest follower. Stop by sometime. I don't like chipped polish either. That's why I only polish my toes! They are my best feature!